Mencap Wolverhampton was founded in April 1969 by Ruth Pursehouse and me. In those days we were called the Wolverhampton and District Society for Mentally Handicapped Children and Adults. In those days parents were meant to be seen but not heard and every learning disabled child was written off as severely disabled and many were put out of sight and mind in large out of borough institutions. The Royal Mencap Regional Officer Mrs Jean Cole had worked with us since 1966. We had started an Opportunity Play Group for learning disabled children and their siblings. At the same time as the children played the parents met in another room, often having a relevant speaker. This group was the nucleus of our Mencap. We met with opposition from social workers, heads of Training Centres and doctors except for the then Deputy Medical Officer of Health, Dr Neville Garratt. He allowed us to send him stamped envelopes which his staff addressed and sent to parents of learning disabled children, all of whom were looked after in those days by the Department of Health. We had meetings through the winter of 1967 – 68, and finally voted to start Mencap. Over the years the services for those with a learning disability improved notably with the Education Act of 1970. Now I dread the downward track of benefit cuts, service closures and support withdrawal. 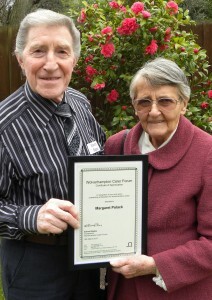 President of Mencap Wolverhampton, Margaret Polack, receiving her certificate from Ted Bagley, Chairman of the Carer’s Forum. We are immensely proud that the officers of the Wolverhampton Carer Forum nominated our President, Margaret Polack, as the first Community Champion. 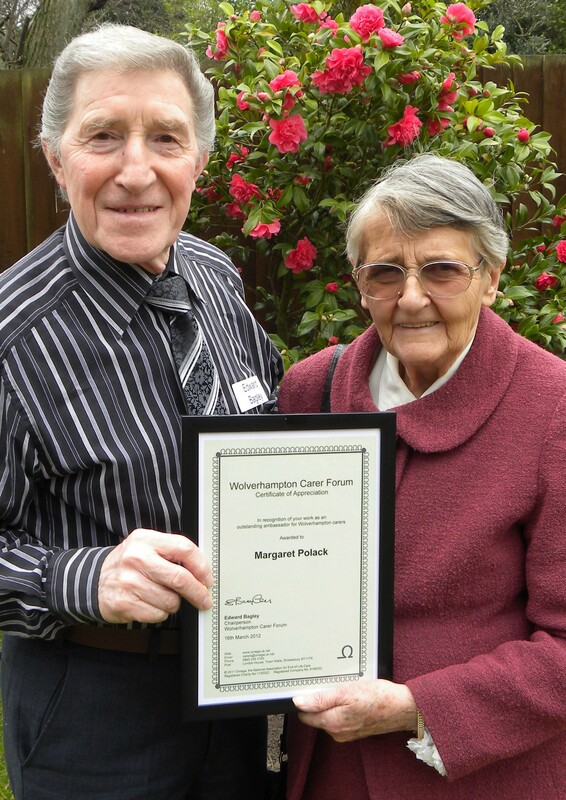 This nomination was in recognition of Margaret’s work as an outstanding ambassador for Wolverhampton’s army of 29,000 unpaid family carers.